This series of Black & White paintings was the result of a fun, and exciting challenge to myself. I wanted to create a series of paintings that used exclusively black and white, while still maintaining my current artistic style. The challenge for me was that I typically work in vibrant colors and play the colors off of each other so as to add depth and movement to my works. I decided that the best way to work with a monochrome palette was to think of, and treat texture and sheen as I would a different colors. Most of my works consist of only a mars black, matte mars black, titanium white, and iridescent white (For a limited number of larger works I added two additional “colors” by adding a texture compound to the mars black, and glass beads to the iridescent white). In my mind while painting, I treated each variation of black and white as if I had four separate colors, and painted as I would had they been for very different and vibrant colors. I had a tremendous amount of fun working on this project. Because the works are in black and white, they tend to appear “flat” when scanned or photographed, but in person the dimensional effects that the matte mars black and iridescent white really pop! 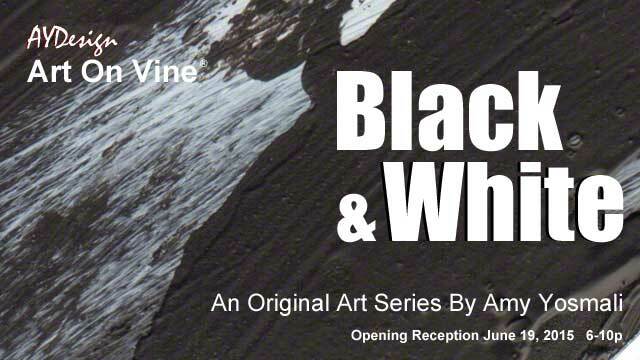 The Black & White Series will be on display at the AYDesign – Art On Vine® gallery June 19th – Be sure to stop by, we would love for you to see these beautiful works in person.